I love happy mail and last weeks delivery of 10 lbs. 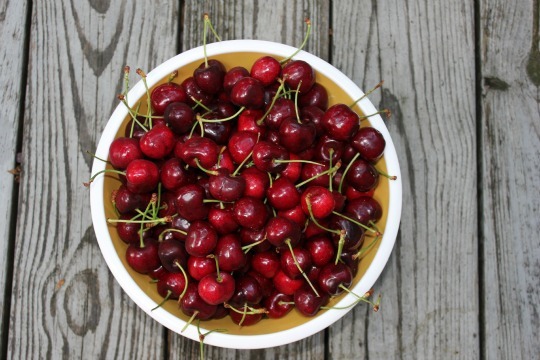 of sweet, juicy cherries definitely made me happy! I was lucky enough to be chosen to participate in the 10 lb. Cherry Challenge sponsored by the super nice people at OXO and the NW Cherry Growers. They have challenged myself and twenty-two other food bloggers, to post recipes using, what else!?!? 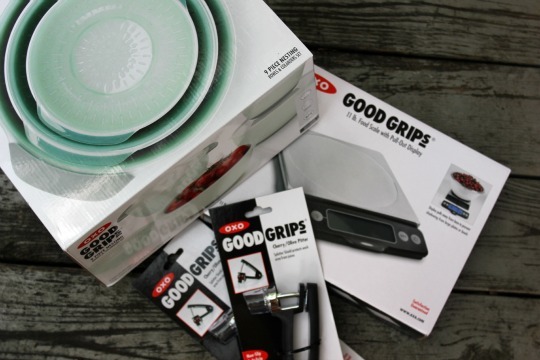 I also received a nice digital food scale, two cherry pitters and a fabulous set of nesting bowls, each with their own colander and lid. I can already tell I am going to use these ALOT. After eating almost an entire pound of cherries while I contemplated what to make, I decided on a healthy snack that I could take to work. I don't know about you, but mid-morning I need a snack! 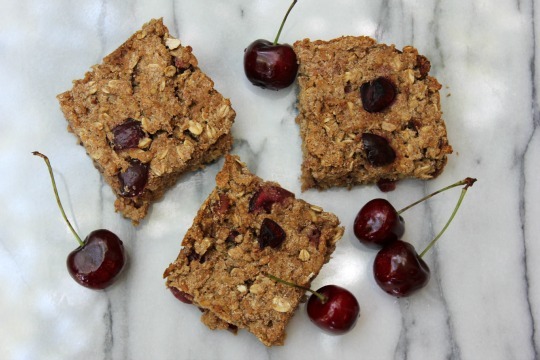 Cherry Pecan Oat Bars are a snack you can feel good about eating. Here's what I used to make them. Preheat oven to 375 degrees. Coat 8 x 8 bake dish with cooking spray. 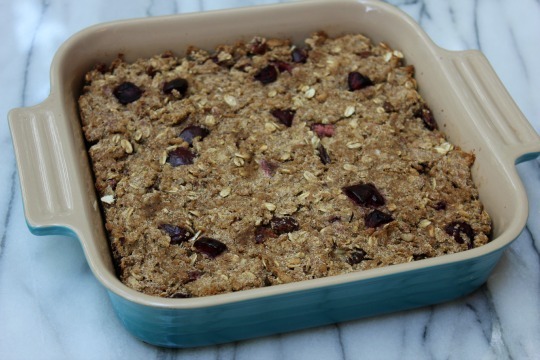 In a large mixing bowl, combine cereal, oats, flour, flax seed, pecans, cherries, brown sugar, cinnamon, nutmeg and salt. In a small bowl, combine milk, egg and vanilla. Pour the wet ingredients into the dry, mixing until well combined. Pour into prepared bake dish. Bake 20-25 minutes or until lightly browned. Cool on a wire rack. Cut into 12 bars. Wrap them individually and store in the fridge or freezer. be sure to check out some of the other 10 lb. 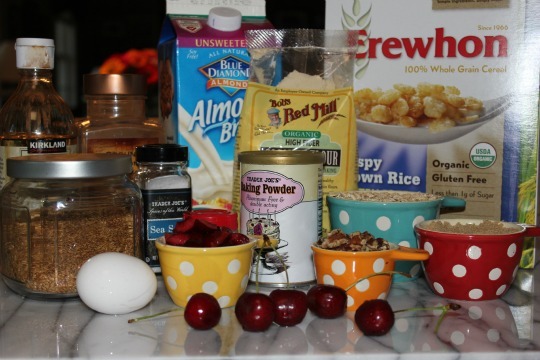 Cherry Challenge blog posts too! Cherry Salsa from Eat. Drink. Love. Disclosure - As part of this challenge I was sent 10 lbs. 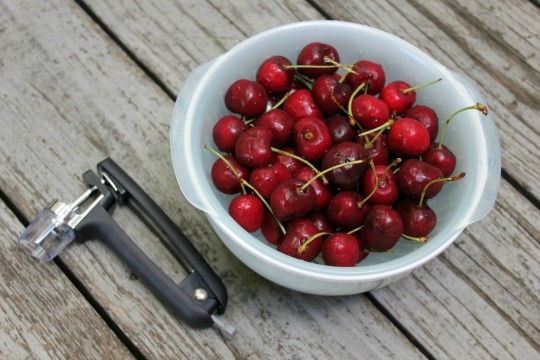 of cherries and OXO products. I was not compensated for this post. All opinions are my own.